Patrick Charnley of Eversheds obviously want to draw as much attention as possible to my original article about Train2Game. And provides further evidence for my article about how the internet is being censored. I would like to point out to Patrick and to Train2Game and to Metropolitan International Schools Ltd that there is an automatic right of reply built into an internet blog like this. At the bottom of every post there is a comment section where they can put their side of the argument, without the need for any recourse to law. This is what most people do and it gives the reader a balanced view of the issues. I suggest that they do this. You appear to have missed a page out. Retroactive claims of copyright infringement? “We sent you that, but you can’t show anyone – even though there’s no such notice on what we sent you”…you have got to be kidding. You forgot to blur your details again. Bruce – not that I would want to tell you how to respond, but since Eversheds are likely monitoring these comments, perhaps they might like to consider these points anyway. First of all, how is the correspondence “confidential” – how does the confidentiality arise and what in the correspondence is confidential? Simply stamping it at the top of a document does not make it so, if the document does not contain any confidential material. 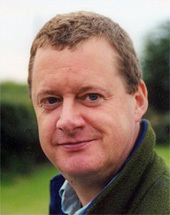 There is no relationship between you which would imply a duty of confidence (unless you happen to be working as a doctor on the side and are treating Mr Charnley – an unlikely possibility), and you have not agreed to treat anything they send you in confidence (which is no doubt why they are so keen that you do agree – but why should you?). Everything else in their letter is in the public domain – in fact that’s the nub of their complaint, and were they to follow through on their threat and sue you, it would all enter the public domain as part of any proceedings. 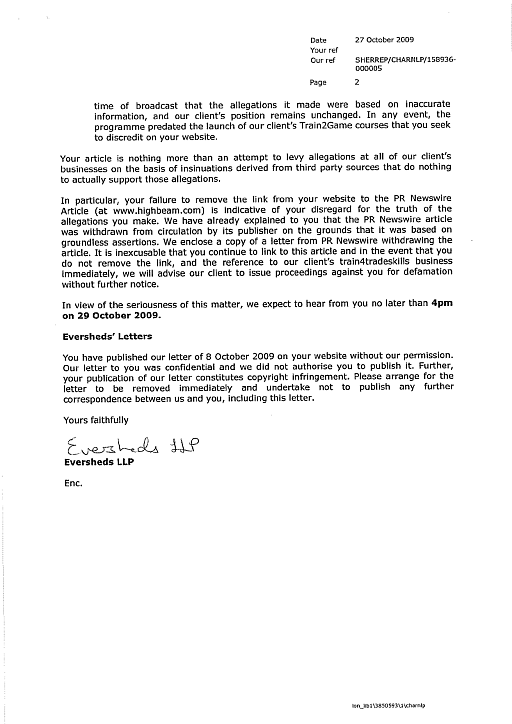 Secondly, by copying the letter onto your site, Eversheds claim you have breached their copyright. I suggest you counterclaim for breach of your own copyright, since there is a strong chance that Eversheds have reproduced and copied your blog posts multiple times for internal use in advising their client and preparing the two letters sent to you. Of course, they would argue fair use – as should you – to any claim for breach of copyright. 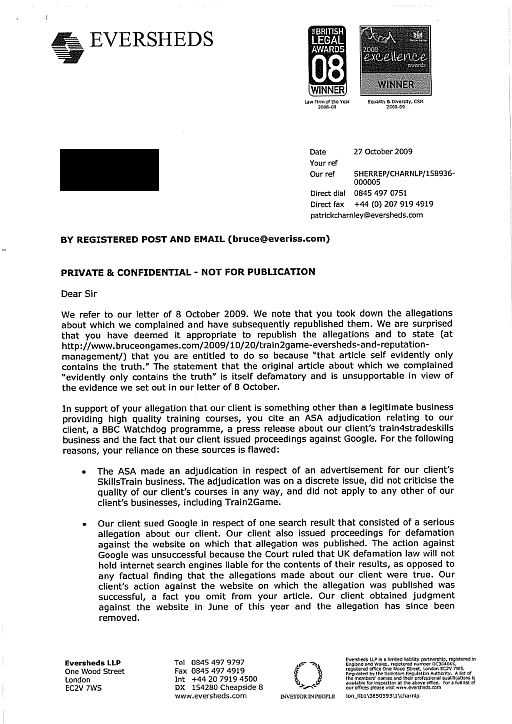 In any event, given that they are so keen that your reports involving their client do not miss any detail which they in their own opinion consider important, your safest route is surely to print the letters in their entirety so that you can explain to their readership what the threat is about, without being accused of misrepresenting it. Last time I checked, a document had to have “Private and Confidential” or similar on each page in order for it to be considered as such. Copyright infringement doesn’t count as you are not claiming the work as your own. Bob – do you work at Eversheds by any chance? Just trying to help – nope. Just accidentally came across this post and thought it was funny as hell. Just cos you’re not claiming it as your own doesn’t mean you’re not breaching copyright – for example, where you sell a counterfeit painting etc. Bruce, as pants as I think T2G are (I saw the videos that have now been removed, too), I’d suggest you probably should take the letter down. Spoke to a lawyer friend of mine who works at a city firm, and he said that so long as it has a confidentiality notice on it then it IS confidential. If you don’t take it down they’ll simply report you to your ISP. It’s not worth it. You’ve made your point, time to move on. I’ll give you this Bruce, you’re not easily scared. I’m not a lawyer, and don’t know the intricacies of the law involved with copyright and confidentiality…but does stamping ‘confidential’ on something make it so? If I sent Bruce a letter detailing my deepest darkest secrets and marked it ‘confidential’, would that protect me? I’m not sure I can see how…I mean, biographies (official or otherwise) and expose’s are released every day about people, some of which I’m sure they wish was secret, but…I’m not being sarcastic here, just really wondering does simply rubber stamping something make any difference? Especially when the information contained in it is basically public knowledge? Mark, ask your City Lawyer friend what would happen if Simon Cowell wrote a letter to the Daily Mail admitting some scandalous behaviour, would they be prevented from reporting it just because he marked it “confidential”? No, they wouldn’t – because he couldn’t reasonably have expected them to keep it confidential. 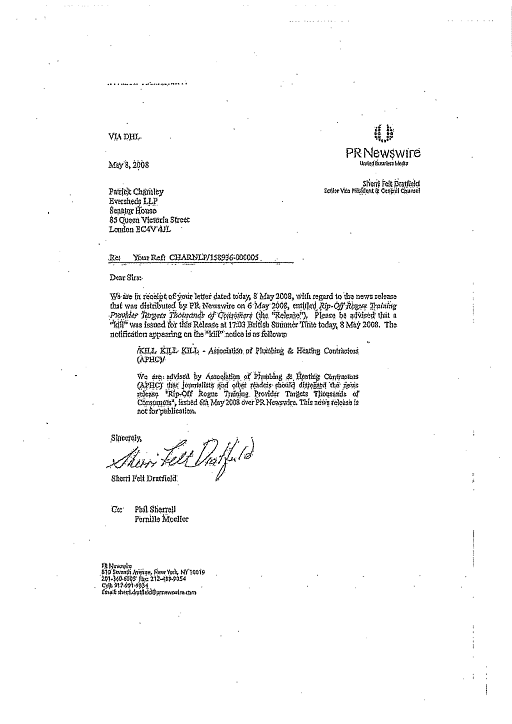 I think there are different rules though where law firms are involved in trying to settle a dispute, especially where there is a confidentiality notice on their correspondence. I’m as interested as anyone to see what happens, but my only worry is that if they have to get an injunction requiring Bruce to take the letter/article down, then he’s going to be the one required to pay their legal fees. And Eversheds are far from cheap. That’s all. Bruce, I’d at least speak to a lawyer about it, instead of trying to take a stand by yourself here. One of the allegations made in the initial Train2Game advertising and touched on in the video was that UK universities do not offer appropriate courses that are designed to place students in the games industry after graduation. This is quite a claim to make. In reality Train2Game claims to understand the games industry better than all UK universities and computer training establishments. Indeed, it appears that this claim was made prior to a single person graduating from their own home learning course. Might I suggest refering these claims and the video concerned over to the Education Secretary, because it looks like it might be appropriate for the educational regulator to look into Train2Game. Prospective students do need capable advice from experts in the games industry; especially when companies like Train2Game infer that their courses are better that those offered by other UK universities. With claims like this it stands to reason that the material offered by Bruce on Games is of public interest. Legitimate educatiuonal establishments do not guarantee employment, practically all student references offered to a prospective employers come with a formal disclaimer. This disclaimer tends to be rather long from some universities. In this respect when I see a private education company making exagerated claims about the games industry and making inapropriate promises to prospective students, I tend to think that it is employing unfair advertising. Naturally prospective students that do not have university experience are vulnerable to such advertising claims, especially if they have failed to reach the necessary academic requirments to undertake a legitimate course through a legitimate educational body. Everyone is capable of acquiring a good education, but not everyone is capable of acquiring common sense. A wise person acquires both, an unwise person has neither. Well I teach at the University of Glamorgan in Wales UK and we have quite successfully been running an industry focused Computer Games Development Degree for three years, so that claim is a load of old Crap!!. I think the other thing to remember is that for a long time T2G stated that there was NO LINK WHATSOEVER between them and Skillstrain. If they lied about that….. If we just look at the credits of your establishment, the University of Glamorgan, we can see that some graduates have gone on to perform some very capable roles in the industry as can be evidenced here http://www.glam.ac.uk/coursedetails/687/706. This is why I find claims made by the Train2Game misleading. This of course does not mean that legitimate industry courses are of no benefit to students. Indeed capable private educational bodies should work in partnership with universities, not against them. This is how one needs to judge such courses. So if Train2Game were to simply declare which universities they work with, then it will be possible to validate the claims they are making through academic channels. However, Train2Game prefers to refer people to TIGA http://www.tiga.org/Train2Game.aspx. As you can see TIGA promotes Train2Game and acts as a governing body in the games industry. In other words it serves the self-interests of the people and companies that are members of TIGA, not the students. It should of course be born in mind that the original article produced by Mr Everiss is likely to have come about due to a Train2Game advert that featured in the ads section of Bruce on Games. I viewed this advert and it took the viewer to a video. I wonder if Eversheds have seen this video? More to the point I wonder how many universities have actually seen it? Here is the Train2Game video advert that was featured on the Bruce on Games website that is likely to have inspired the offending article. The link is to what claims to be the Train2Games YouTube account. This way you may view it at source along with their other videos. In my view the Train2Game representative whose audio comments were presented by Bruce on Games through a recorded interview conveyed the same idea as was presented by Kim Adcock MD of OPM Response Ltd in the Train2Game advertisement. In this respect, contrary to the claims made by the Train2Game representative, Eversheds, the video comments that featured in the Bruce on Games article do directly reflect the views of Train2Game that carries with it the authority of TIGA. If an MD in an organisation is prepared to claim that university courses are substandard to Train2Game courses, then I would expect sales representatives to share the same view. Therefore, Train2Game do challenge the credibility of university courses within the UK through making claims like the one secured by Bruce on Games. If the advertising of Train2Game’s confirms the claims made by the recorded representative of Train2Game then this is not a privacy issue. Individuals and companies associated with TIGA have been cited for claiming that the Train2Game home learning course is better suited than courses offered by universities. In this there is no doubt. Perhaps some law firms should come together and offer their own unique home learning legal courses and offer to make the best barristers and judges too, but somehow I feel that their attorneys and the Law Society may not support this idea unless it is properly regulated. So the real question is how does TIGA regulate Train2Game to enable it to excel the standards of all UK universities? This is the real question. It is rather sad to see a major law firm that supports the academic tradition humiliate itself before the academic community like this. This is why law firms need to consider cases with much more care and diligence when the legal issues pertain to public domain issues. Hopefully the other law firms that are following this issue may learn from this experience and will exercise greater judgment when deciding whom they will represent in future. Likewise organisations like YouTube need to fully understand the implications of hosting Train2Game material and removing Bruce on Games material, especially when YouTube permits videos from Train2Game to make libel statements pertaining to UK university courses on computer gaming. University environments teach individuals much more than the skills UK employers require. They prepare students for international companies because the games industry is international by default. If Train2Game is only offering an apprenticeship course for some UK games companies associated with TIGA, which I suspect to be the case, then this should have been stated in their advertising. To assume that an industry home study course in a comparatively new field is capable of excelling all university courses within the UK is an insult to the entire academic fraternity. Hopefully Bruce on Games might consider offering an article that addresses the educational routes that are open for prospective students in computer gaming. I am sure many universities would welcome the opportunity to place the claims made by TIGA and Train2Games into a more informed context. Memo – please note that the Train2Game thanks the following parties at the end of their video. This lasts for a fraction of a second. For the benefit of viewers here the following people and organisations support this Train2Game advert. Somehow I am rather confused as to why some international organisations are prepared to be associated with the views being made on UK university course. Perhaps they should be contacted to see if they endorse the claims made by Train2Game that features on YouTube. As you quoted Kim Adcock as saying. And rightly so, we don’t dish out degrees just for turning up, at university you actually have to earn your qualification and demonstrate clear ability. I know this is obvious, but what Train2Gain are saying is that we guarantee you will pass the course no matter of your actual ability, or effort. In other words pay the money, wait a while, get a shiny certificate. And of course Kim Adcock had a bit of a falling out with Train2Game after it seems some of their advisors were answering phones claiming to be OPM response Ltd. It has just been brought to our attention that should you call the Train2Game customer service number advertised on our web site it is being answered by a telesales team claiming to be OPM Response Ltd. This number does not reach the offices of OPM Response Ltd, we have no connection to the people answering this number and they are absolutely not employed by this company. They do not represent this company in any way shape or form. If you do have enquiries regarding the Train2Game course a new number will be published shortly. Apologies to anybody who has been mislead – I would very much like to hear from you. The denial of a link to Skillstrain was made by Clive on both the Train2Game forums http://forum.train2game.com/showthread.php?t=37 and also on the thread that got pulled over on Digital Trends. It was then spotted that the Train2Game logo was trademarked to Scheidegger…. Previous Post: How popular is Bruceongames?